Blue Energy Drink is a natural energy drink made by Blue Sky Beverages. They claim to use only natural flavors, natural caffeine and a special proprietary energy blend to safely give you that extra edge! All of Blue Sky's products contain no artificial color, flavors, or preservatives. In the sugar-free versions of Blue Sky Energy Drink, the natural sweetener Truvia is used. Blue Sky has joined with Hanson's Naturals and Blue Energy Drink is available in most States and Canada. Ingredients: FILTERED CARBONATED WATER, SUCROSE, GLUCOSE, CITRIC ACID, NATURAL FLAVORS, TAURINE, SODIUM CITRATE, GRAPE SKIN EXTRACT (COLOR), GINSENG EXTRACT, L-CARNITINE, NATURAL CAFFEINE, ASCORBIC ACID, NIACINAMIDE [B3], SODIUM CHLORIDE, INOSITOL, GLUCURONOLACTONE, PYRIDOXINE HCI [B6], RIBOFLAVIN [B2], MALTODEXTRIN, CYANOCOBALAMIN [B12]. Sugar content: 28 grams (per 8.3 ounces). 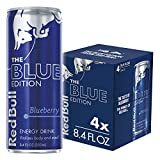 How Does Blue Energy Drink Compare? Blue Energy Drink contains 9.64 mgs of caffeine per fluid ounce (32.59mg/100 ml).